Sport facilities have a two-fold function. On the one hand, they are a necessary support for training performance and sport-related recreational activities; on the other hand, they represent one of the most popular places for social relations. Although there are some quality examples, many structures have unfortunately been built without an adequate context or analysis of functional and operational requirements. 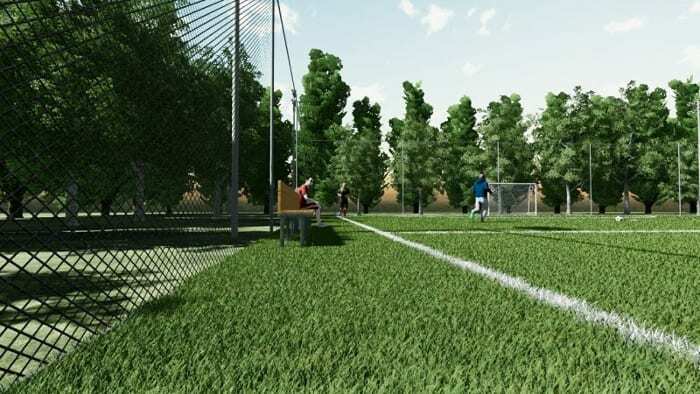 With the use of appropriate tools and following the relevant regulations, excellent results can be obtained in terms of sport facilities design and construction. 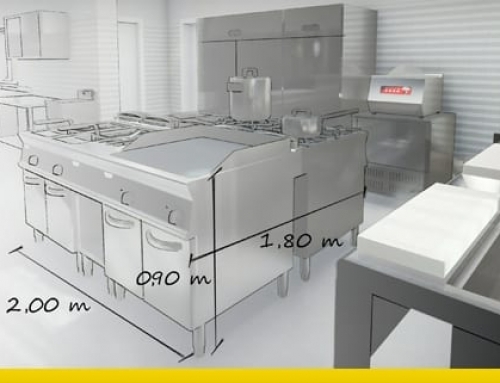 In this technical guide we’ll be dealing with some fundamental design aspects starting from international federal regulations and standard measurements indications, delimitations and permanent equipments together with different types of flooring selection. 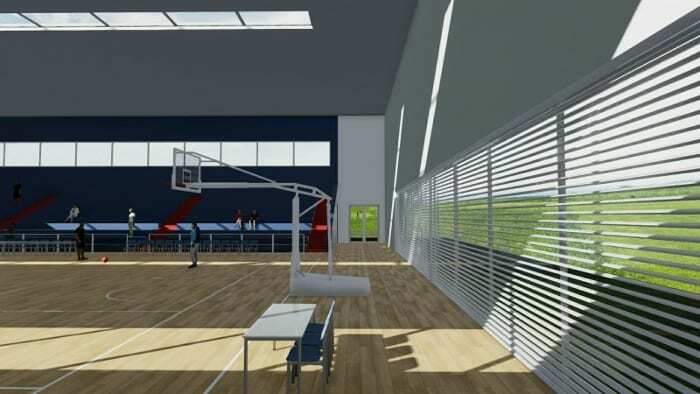 in the second one we will focus on how to design a tennis court and the changing rooms. 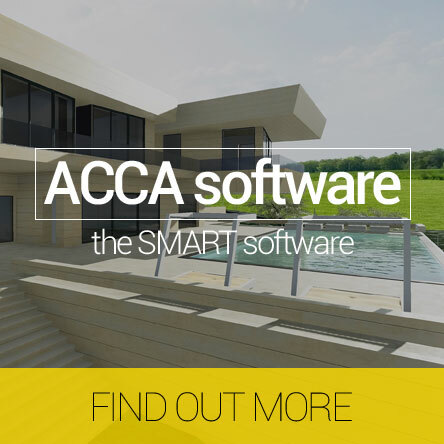 In this article you’ll be able to find technical drawings in dwg format and the project 3D model in .edf format, immediately available for download, that have been simply and rapidly created with the help of an architectural BIM design software. All regulations and indications at international level for pitch dimensions are contained in the Futsal Laws of Game by FIFA (Fédération Internationale de Football Association). There is another international federation, very important especially in South America, for management and promotion of the “fútbol de salón”, called AMF (Asociación Mundial de Futsal) which has produced its own international regulation. Futsal can be played on both indoor and outdoor pitches. Futsal is normally played on a rectangular shaped 5-a-side pitch. However, for international games, such measures are reduced to a minimum of 38 meters by 18 (125 by 59 ft) , up to a maximum of 42 meters by 22 (138 by 72 ft). The goal must be fixed to the ground to prevent it from overturning. The distance (inside measurement) between the posts is 3 m (9.8 ft) and the distance from the lower edge of the crossbar to the ground is 2 m (6.5 ft). Both goalposts and the crossbar have the same width and depth, 8 cm (0.2 ft). The goal depth must be at least 80 cm (2.6 ft) on the upper edge and 100 cm (3.2 ft) at ground level. Nets must be made of hemp, jute or nylon, or other approved materials. 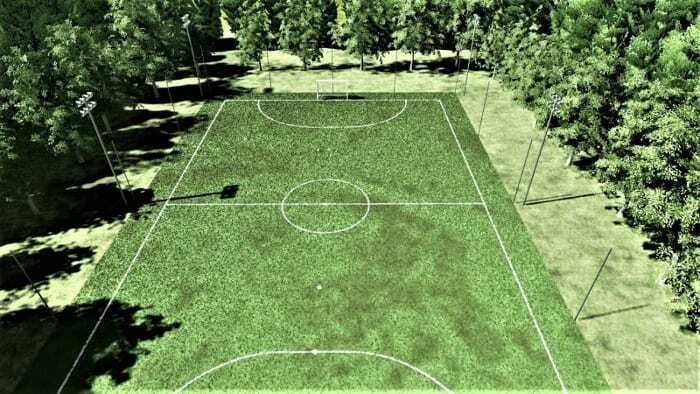 By regulation, a futsal pitch flooring can be in PVC, rubber, resin and parquet or, in synthetic grass in case of locally played games and amateur activities. 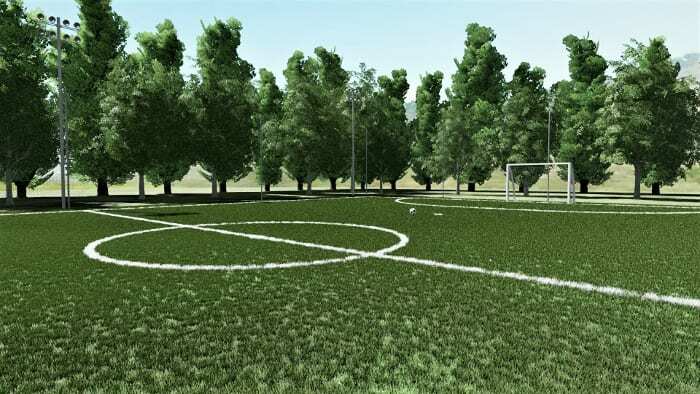 Natural grass can only be used for outdoor recreational activities. The surface must be flat, smooth and non-abrasive; only a maximum slope of 0.5% is allowed in the direction of the axes. Concrete or tarmac should be avoided. For UEFA and FIFA international competitions, synthetic material are usually coloured in blue to increase the contrast between the pitch lines and the ball. vertical, traditional drainage with aggregates or pipes. 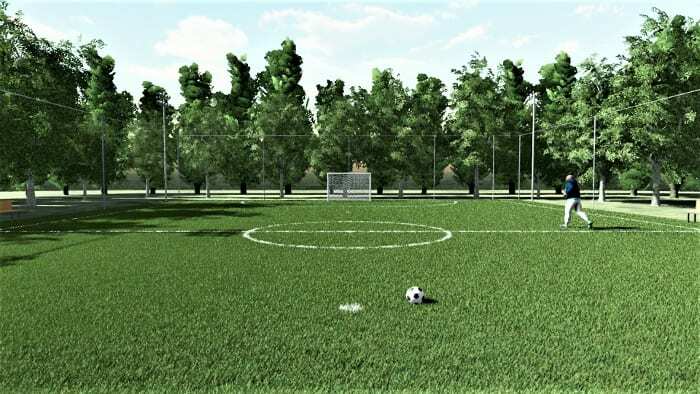 Futsal pitches are normally enclosed and adequate fencing should be installed. 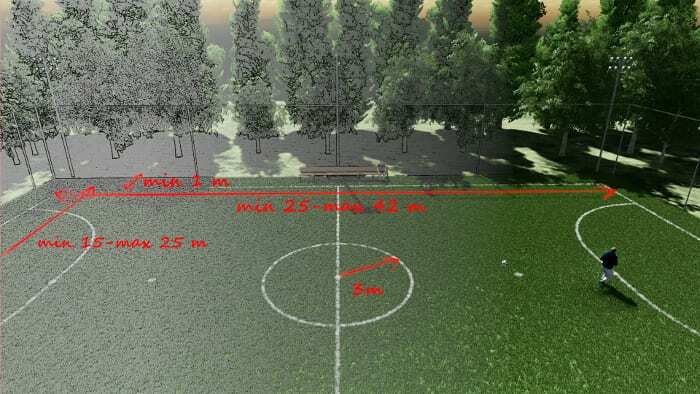 The minumum distance of installation should be 1.50 m (4.9 ft) from lateral lines and 2.00 m (6.5 ft) from the goal lines, with minimum tolerance allowed. The use of suspended nets above the boards is also common to ensure balls remain within the pitch area. 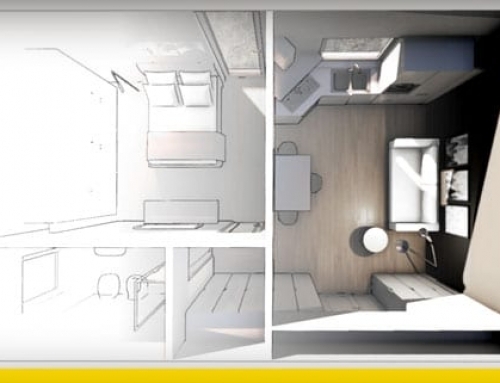 Lighting, both horizontal and vertical, is another fundamental aspect not to disregard. The ideal lamps have metal halide and white light, with RA greater than 80. Finally, emergency lighting is mandatory for the safety of spectators when leaving the sport facilities. 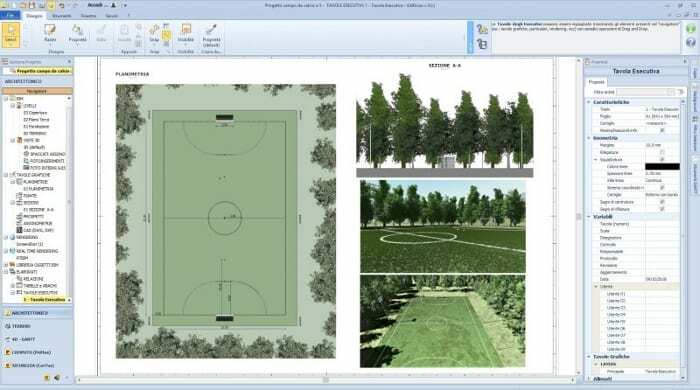 In this section you’ll find the project drawings and the 3D model of a futsal pitch example. 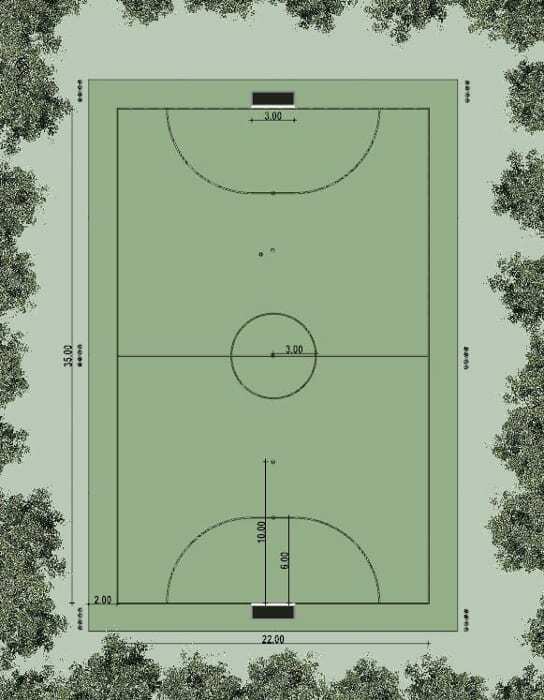 The first step for a basketball court project starts with choosing a suitable site. 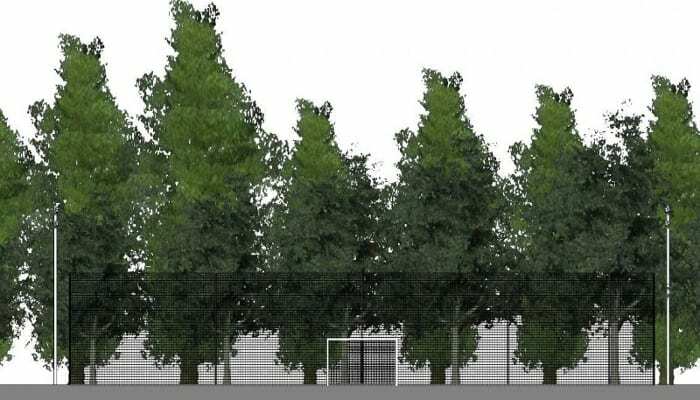 In fact, the construction design requires a lot of space as, typically, courts can reach almost 30 m length. Along the length of the court, it is necessary to add borders, such as sidelines and endlines or baselines, thus increasing the court perimeter. FIBA, the “Fédération Internationale de Basketball”, is an association of national organizations which governs the sport of basketball worldwide defining its rules and specifying standards, equipments and type of facility required. Here you can download the FIBA guide for basketball courts and facilities. 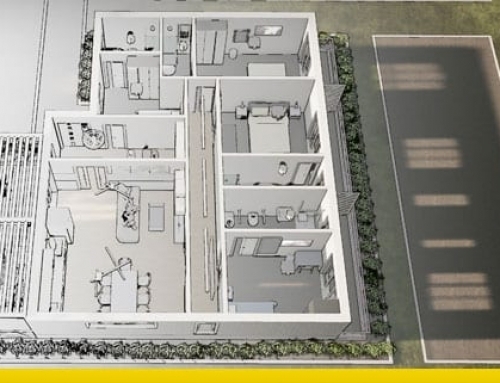 During the design phase, different national building regulations should also ideally be indicated. With regard to flooring, the international reference standard is EN 14904. The court must necessarily have a rectangular floor 28.00 m in length by 15.00 m in width (91.9 by 49.2 ft). All lines must be 5 cm large and clearly visible. 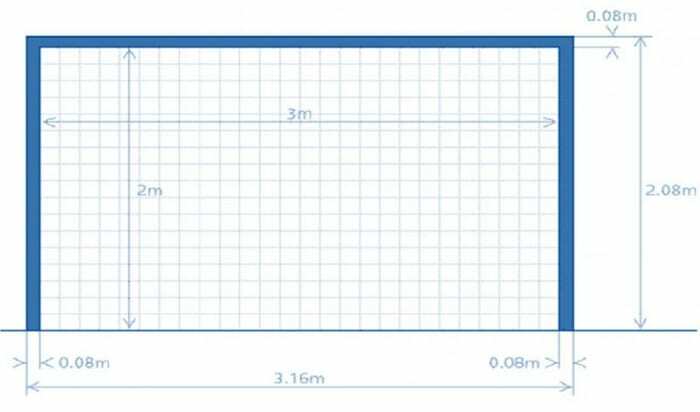 Since 2.00 m wide boundary lines must be envisaged along the court perimeter, the total court covers an area of 32.1 m x 19.1 m (105.3 by 62.6 ft). In case of indoor courts, the ceiling height should be at least 7,00 m (22.9 ft) from the ground. Naturally, the two basketball steel rims with nets and blackboards are essential elements, together with protection and support systems, and a scoreboard with a timer. 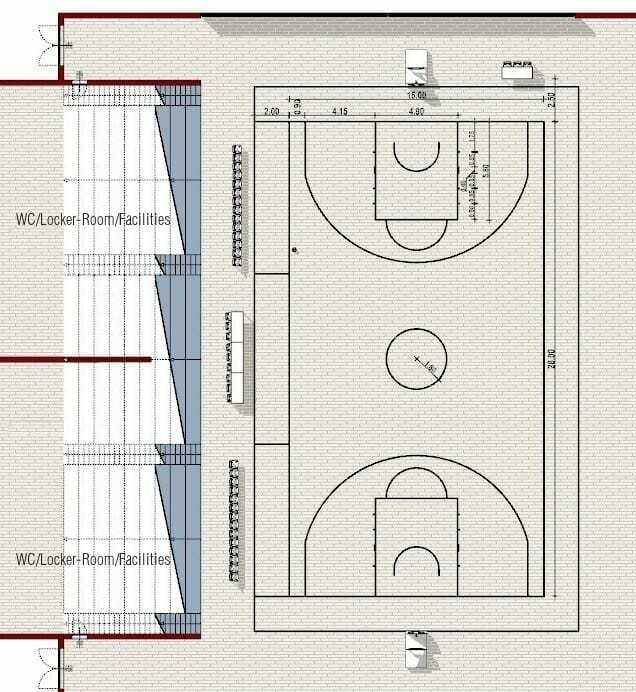 The basketball rim (hoop) must be installed at 3.05 m height (10ft) from the court floor. The choice of flooring materials is quite wide. Typically, hardwood, often maple, is the material that is privileged for indoor basketball. one or more elements colouring are allowed, matching borderlines, the three-point line and the center jumpe circle. the areas outside and inside the three-point line must not be painted with dark colours. On the contrary, in case of outdoor courts, synthetic materials are preferred, such as acrylic resin, rubber, PVC, polyurethane with synthetic rubber granules, to provide greater elasticity and higher resistance to atmospheric agents. Lighting is a fundamental element for a basketball court design. Diffuse natural light, preferably coming from the roof, is advisable. In case of natural lighting coming from the facility sides, manual or mechanical shielding should also be provided. The artificial lighting system is mandatory for indoor installations and must avoid glare and reflection for athletes and spectators. 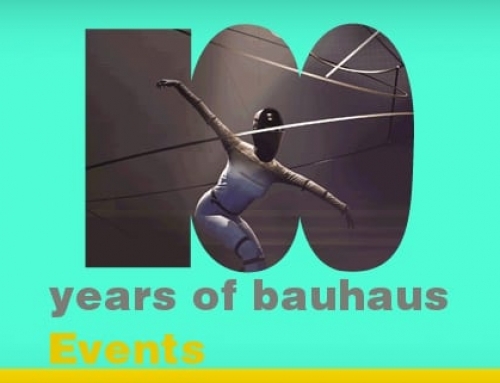 Temperature must be constantly maintained not lower than 16 ° C and not higher than 20 ° C.
The relative humidity percentage must not exceed 50% and an adequate air exchange must be provided to allow suitable hygienic and comfort conditions for the athletes. 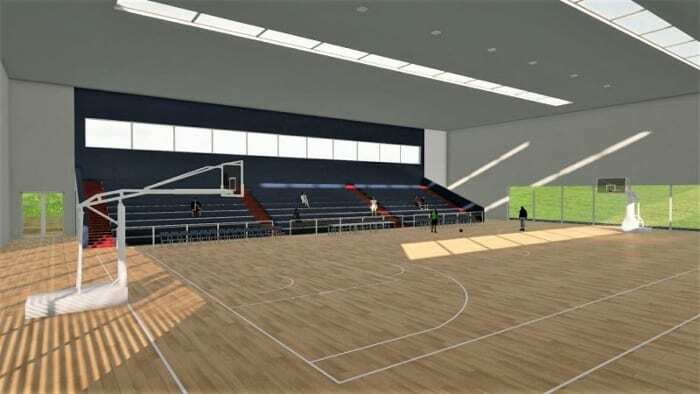 Below the project drawings and the 3D model of a basketball court design available for download.